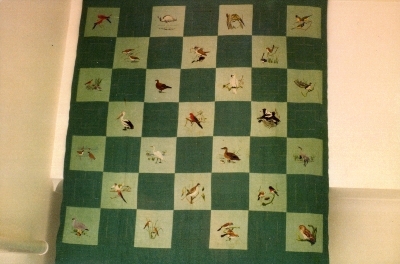 Patchwork quilt made from alternate squares of light green and medium green cotton headcloth. 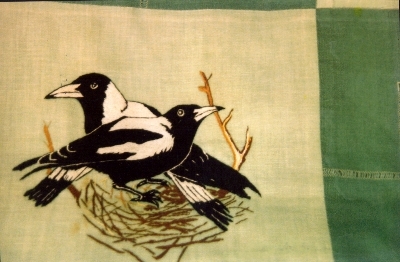 The light green squares are hand embroidered with Australian native birds, the medium green squares are decorated with pulled thread designs. No padding. Backing and binding of medium green headcloth. Made from patterns published in The Adelaide Chronicle. Made by Mrs Emily McKay of Semaphore Pt (SA) in 1934. 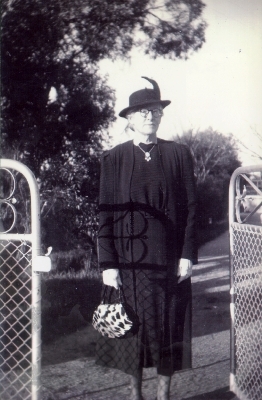 Owned by her youngest daughter, Mrs Shirley Cocking, now owned by Shirley's niece Mrs Wendy Springbett. Emily's quilt won first prize in the Adelaide Royal Show. "I think she made a second quilt (the one featuring noted places of the world). It was raffled during the war in aid of Red Cross and was won by a relative on her husband's side of the family. �"
The patterns for the quilt were published in The Adelaide Chronicle, a weekly newspaper in South Australia, in 1934. They were also reprinted in the Weekly Times, a Victorian weekly. "The quilt consists of 12 blocks of crazy patchwork with an embroidered border. The quilt is made of 167 different fabrics; most of these are silk. These velvets, printed silks and satins are beautifully embroidered with flowers, household items and Kate Greenway images of children at play. Many of the motifs have a strong influence from the Aesthetic Movement. The edge of the quilt carries a border in maroon silk decorated with tendrils and daisies in very fine embroidery. Patchwork top with a centre frame of a mauve cross outlined in black within a square bordered with pink. The rest of the top is rectangles and squares in a wide variety of materials. There is no padding. The backing is brown, possibly curtain material. Patchwork cot or pram quilt made of diamond patches in the Tumbling Block pattern. Patches are made from cotton, corduroy and velvet, with red, black, teal blue, green, brown and cream predominating. No padding. Backing is of green wool and the quilt is bound with dark red crushed velvet. The top is a wholecloth piece of twill type cotton and the backing is a wholecloth piece of finer patterned cotton. The padding is a layer of pieces of used clothing stitched together, including part jumpers, some darned. These are inside an old folded blanket. Small quilt made from pieces of heavy weight wooollen coat material cut into strips and machined together. It is reversible. Each side is made from different materials but in similar colours of aqua, blue, green and beige. The 2 layers are quilted together with a few machined lines of straight stitching. It has a folded and machine stitched edge. There is no padding.